Are you an artist who wants to turn your passion into profit? Are you selling your art, but not attaining a sustainable living? You may have experienced that it’s not as easy as just showing up at the local Farmer’s Market and setting up a table or exhibiting at a gallery. This 10 week class will help you start or grow your own profitable art or crafts business. 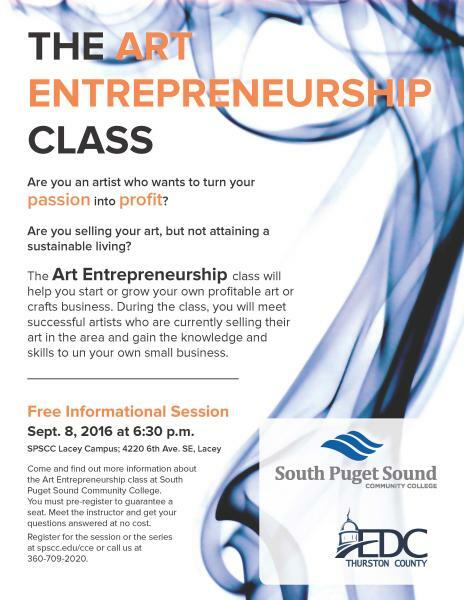 Come and find out more information about Art Entrepreneurship at South Puget Sound Community College. Meet the instructor and get your questions about the series answered at no cost. You can enroll for the free informational session here. The South Puget Sound Business Resource Center offers one-on-one advising programs for small business owners. At any time during the series, participants can take advantage of these programs. There will be an arts event, including a vendor fair, in March 2017 at the SPSCC Lacey Campus. This indoor arts fair will provide an opportunity for participants in the Art Entrepreneurship class, as well as other community members, to showcase their work and utilize selling skills gained through the program. For more information, please call 360-709-2010. This program is offered in partnership with the Economic Development Council of Thurston County.